Chief executive-designate Tidjane Thiam has scope for radical action at Credit Suisse when he joins in July. The Swiss bank’s first quarter shows the outgoing Prudential boss is inheriting a mixed bag. Net profit climbed 23 percent to 1.05 billion Swiss francs ($1.04 billion) from the same period a year earlier, on resurgent trading and wealth management. But progress on weak capital ratios was mixed. The good news for Thiam is Credit Suisse has been growing its wealth management and investment banking business in Asia Pacific. Thiam has seen the same region account for much of the UK insurer’s recent expansion, and at Credit Suisse it now makes up 16 percent of group revenue, up from 13 percent a year ago. Leverage is also falling. The bank slashed 47 billion Swiss francs of relevant assets in the three months to March to reach a 3.6 percent Basel leverage ratio. That is far more in line with rivals than a year ago, and leaves Credit Suisse on track to hit a self-imposed 4 percent target by the end of 2015. But hitting even this goal might not be enough. Swiss politicians could yet raise the threshold far higher than 4 percent. Worse, the bank’s other measure of balance-sheet strength is going the wrong way. Currency movements and equity for share-based bonus awards depleted the capital held against risk-weighted assets, which stayed flat. That reduced the bank’s common equity Tier 1 ratio to 10 percent, the minimum acceptable nowadays for a bank of Credit Suisse’s size. Investment banking is the main culprit. The division’s 149 billion Swiss francs of risk-weighted assets are more than twice those of cross-town rival UBS’s investment bank. And performance has recently been mixed. Credit Suisse lost market share in underwriting and advisory in the first quarter, although it did better than the average Wall Street bank in fixed income trading. Investment bank first-quarter return on regulatory capital looked promising, but used 62 percent of Credit Suisse’s Basel-adjusted gross assets to produce just 54 percent of group revenue. Thiam should conclude that to thrive, Credit Suisse needs a capital hike. And less investment banking. Prudential Chief Executive Tidjane Thiam speaks at the Institute of Directors annual convention in London September 18, 2013.
Credit Suisse posted a 23 percent rise in first-quarter net profit to 1.05 billion Swiss francs ($1.04 billion) from the same period a year ago, on resurgent trading and wealth management. The Swiss banking group also improved its Basel leverage ratio by 10 basis points to 3.6 percent, although its common equity Tier 1 ratio fell by the same amount to 10 percent. Pretax profit in Credit Suisse’s private banking and wealth management businesses fell 18 percent to 834 million Swiss francs from the same period in 2014. However, in its wealth management clients division, which excludes asset management as well as some Swiss clients hit by the sharp increase in the Swiss franc’s value, pretax profit rose 10 percent. Investment banking pretax profit, meanwhile, rose 14 percent to 945 million Swiss francs. 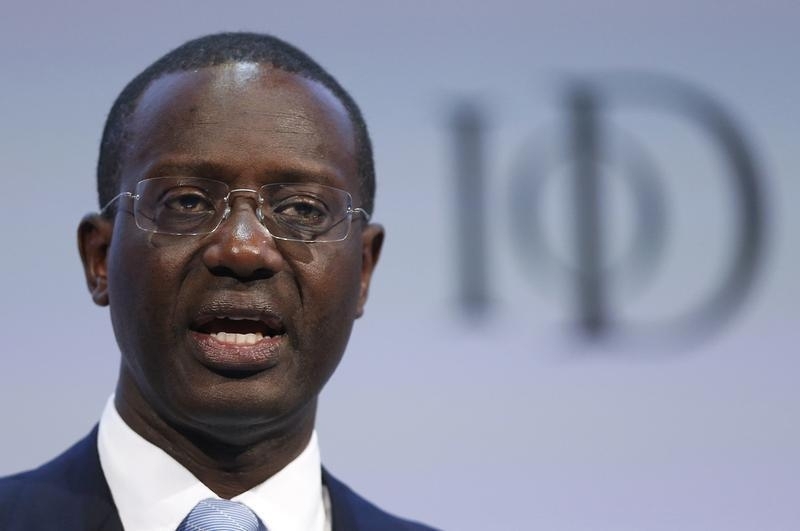 Credit Suisse Chief Executive Brady Dougan, presiding over his last set of quarterly earnings before handing the reins to Prudential Chief Executive Tidjane Thiam in July, praised the “well-diversified” investment bank. However, for the investment banking businesses that Credit Suisse is sticking with, pretax profit fell 1 percent. The division recorded a 9 percent rise in fixed income trading revenue, an 11 percent rise in equities trading revenue, but a 26 percent decline in the top-line for underwriting and advisory. Wall Street banks on average performed less well in fixed income trading, but more strongly in the other business lines. Credit Suisse shares stood 2.8 percent lower at 26.05 francs by 1130 BST.